Turns out, the thumbs-up gesture is an extremely awkward one for me. June 7, 2013 — We’ve all been there. In a strange town, not sure where to eat, only that you’re going to be hungry soon. 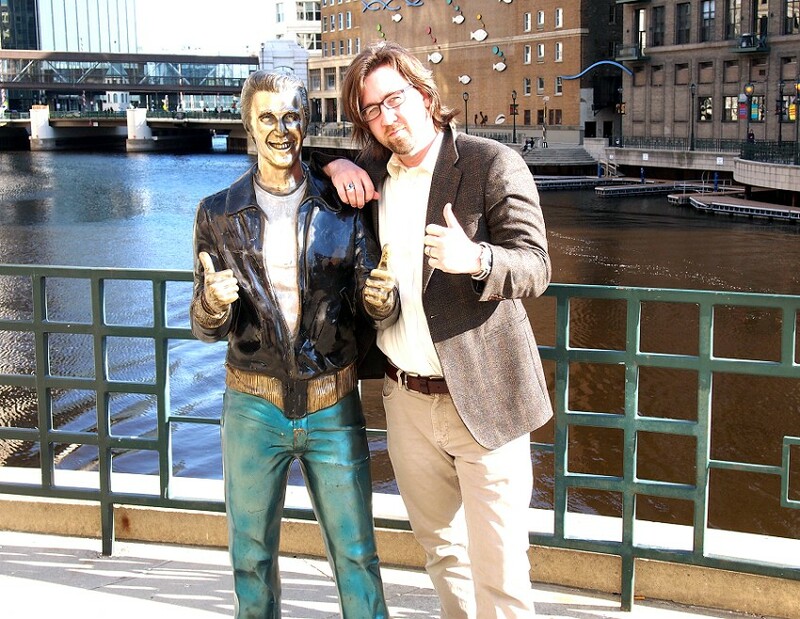 But of all the times I’ve been in that situation, it’s never ended with a Henry Winkler statue. I was with a friend in Naperville, Illinois, when we suddenly realized that we were only an hour from the Wisconsin border and neither of us had been to Milwaukee, another 40 minutes past that. So we drove the buck forty just so we could say we ate dinner there. It’s a beautiful city, that Milwaukee. Seriously. I mean, maybe it was just the few blocks we walked near the edge of Lake Michigan or that my expectations were somewhere closer to streets lined with broken beer bottles, windows filled with cow carcasses, and everything tinted in blues and yellows that had faded decades ago, but Milwaukee really surprised me. Also, I’m not sure where I get my expectations from. The weird part about the experience, though, was that it was a ghost city. Hardly anybody was out. The weather was nice, it was early on a Thursday evening, but I pass more people in my living room on any given day than I did walking the sidewalks of Milwaukee for two hours. There was one guy. 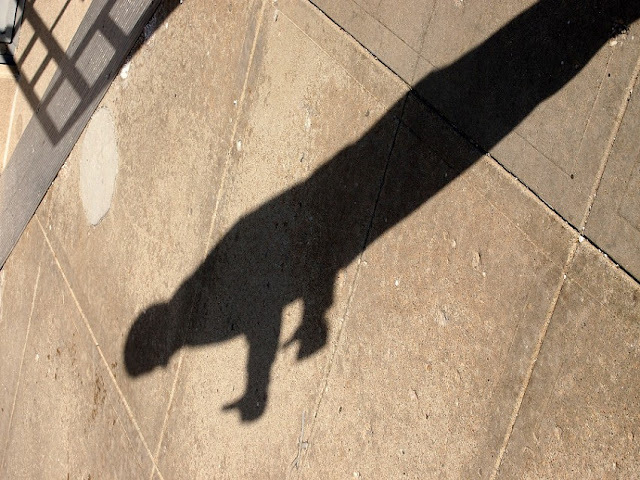 He just stood there by the Milwaukee River, brazen, completely at ease with being his own company in a deserted city, both thumbs stuck out like he was hitchhiking down a two-lane highway and didn’t care which way he went. 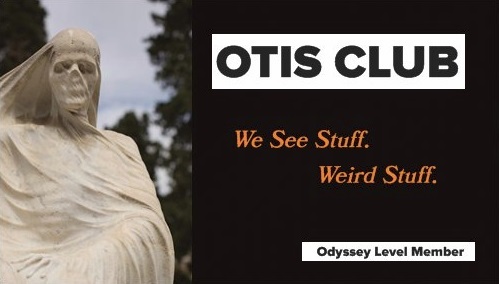 My biggest reason for wanting to jump the Wisconsin border was that I don’t have the state represented on OTIS. And, off the top of my head, the easiest oddity to visit that I knew of was this Milwaukee statue. So, sorry about that, Wisconsin. I know you have much cooler stuff…except that you kind of don’t because, well, Fonz. The Fonz, aka Fonzie, aka Arthur Fonzarelli is, of course, the leather jacket-wearing rebel with a laugh track from Happy Days, the 1970s-1980s sitcom about the 1950s-1960s. Played by Henry Winkler, the Fonz was a guru to the less cool, a master of the “on” switch, a man who wore pretty girls like armbands and whose greatest sin was water skiing over live sharks. Happy Days ran 11 wildly varying seasons, going from gentle character comedy to wacky situational all the way to the outlandish. This was the show that spun off Mork & Mindy, after all. But the one takeaway from the show, the one thing we still reference and reverence, is the Fonz. After all, he gave us cool. Now, cool was around before Fonzie, sure, but the Jews knew not to murder before the Ten Commandments, too. The stone tablets just codified it for them. And that’s what the Fonz did. He codified cool. And for it he gets a golden idol in Milwaukee. 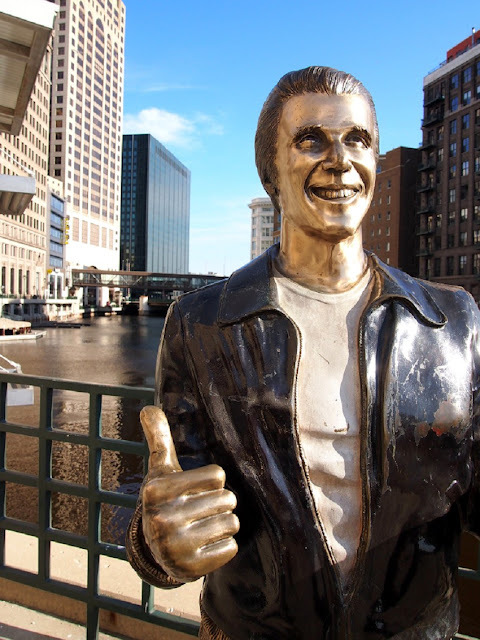 The Fonz’s connection to Milwaukee is that the show was set there. And the people who made that connection set in bronze is the cable channel TV Land. Sort of. In the early 2000s, TV Land sponsored a series of bronze statues of famous sitcom characters erected in spots relevant to the character. Bewitched’s Samantha in Salem, Massachusetts. The Honeymooners’ Ralph in in New York City. The Andy Griffith Show’s Andy (holding the hand of Opie, played by Happy Days star Ron Howard...so that's two cast members with bronze statues) in Mount Airy, North Carolina. They didn’t really sponsor the Bronze Fonz, although the metal plaque between his boots lists them as one of the donors. However, the people of Milwaukee were inspired enough by TV Land’s efforts that they raised the funds for their own fictional character statue, trumping those other statues by unveiling one of the most popular characters in the history of TV. It was during a ceremony in August of 2008, and was attended by Henry Winkler himself and most of the rest of the Happy Days cast. Even Laverne and Shirley were there. 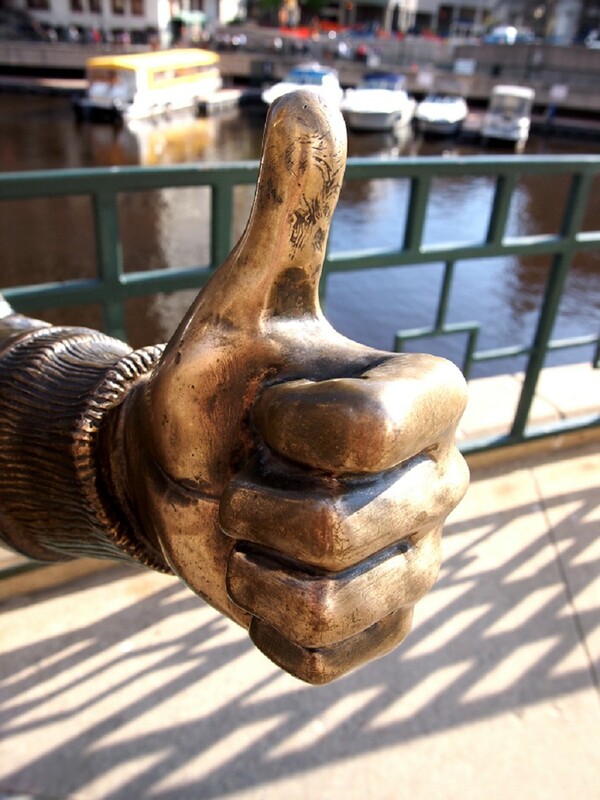 The 5’6’’ statue is set right on the city’s Riverwalk where it intersects E. Wells Street, beside a Chinese restaurant. The clothes and hair on the statue are colorized, and he’s beaming a smile so wide it continues all the way to his outstretched thumbs. Unfortunately, the Bronze Fonz looks like he’s seen happier days. The black on his leather jacket was chipped, and his pants seemed to have transmuted from jean blue to something like bright teal. No mistaking the cool, though. 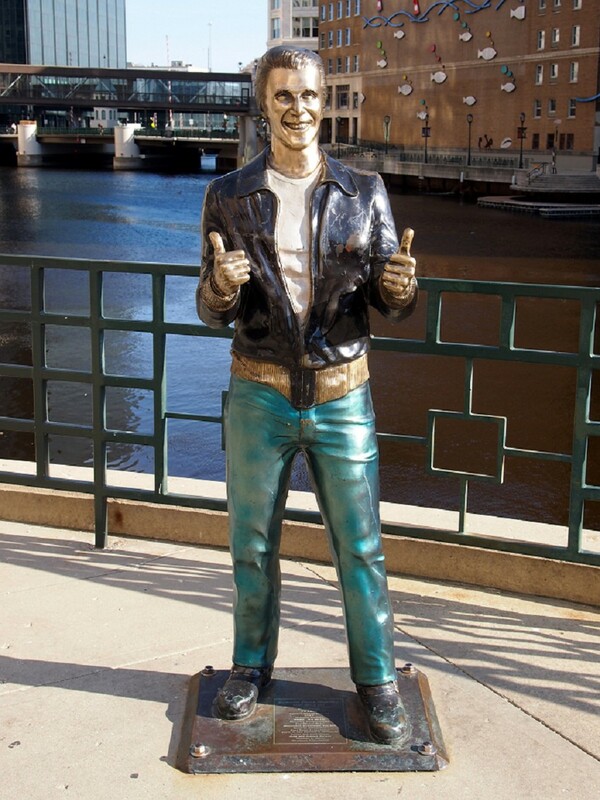 I mean, this is how cool even just a statue of the Fonz is. Despite the barrenness of the city, despite it being 30 years since the show went off the air (I’m not counting this), we still had to wait our turn to get a picture with him. These happy days are yours and mine. Happy Days.